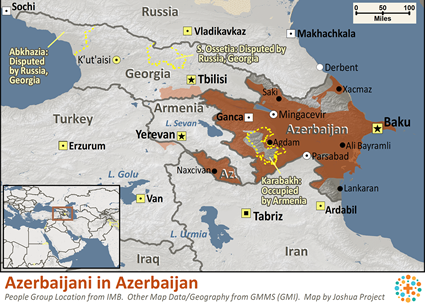 Azerbaijan is located in the Caucasus Mountain region on the western shore of the Caspian Sea. It is there, in the land of the ancient Medes, that we find more than six million Azerbaijani (also known as the Azeri). The name "Azeri" is thought to have come from the fourth century ruler, Atropat, who governed the area that is now northwestern Iran. However, it may have been derived from azer, the Persian word for fire. The Azeri have been subjected to numerous invasions throughout history. The homeland of the Azeri was first conquered by the Persians in the sixth century B.C. Islam was introduced into the area during the seventh century A.D., and has been practiced there ever since. By the eleventh century, Persian influence was overpowered by Turkic influence. During the thirteenth century, this region of Asia fell under the dominion of Genghis Khan. Masalli and Gabala-- are covered with thick forests. The climate ranges from warm to sub-tropical temperatures. Grain, grapes, cattle, sheep, and goats are raised in abundance. Vegetables, fruits, and some teas are also important products. Although the land is ideal for farming, about one fourth of the population now lives in Baku, the nation's capital, working in industry. Russian involvement in the Transcaucasus began in the early eighteenth century in an attempt to obtain raw materials. In 1922, Azerbaijan was incorporated into the Soviet Union. This changed the face of the nation, mainly through the development of petroleum resources. Most Azerbaijani continued to farm the rich soils, but many moved into the cities to work in industry. There they found themselves working unskilled jobs and taking direction from Russian managers. Azerbaijani settlements were traditionally divided into villages made up of extended families. In an attempt to protect their culture, marriage within the family was encouraged. Unions between first cousins were considered the most desirable. Marriage to a non-Azerbaijani was almost unheard of prior to the Soviet period. Polygyny (having more than one wife) was only allowed in cases of infertility. The Azerbaijani diet consists mainly of rice pilaf and a variety of grilled and boiled meats including beef, goat, and lamb. Traditional dishes include bozartma (mutton stew), dovga (a soup made from yogurt), meat, and herbs. Other dishes are dolma, khingal, kabab and dushbara. Tea and wine are popular drinks. 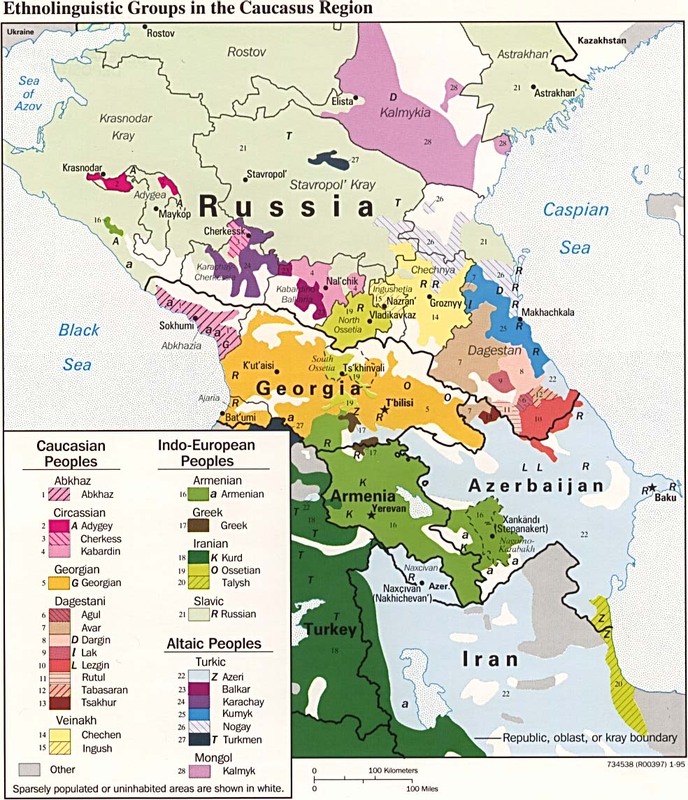 The Azeri language belongs to the southwestern (Oguz) branch of the Turkic language family. Azeri has a written tradition that dates back to the fourteenth century. 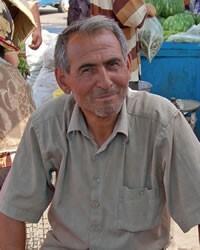 The Azerbaijanis are primarily Shi'ite Muslims, but there are a number of Sunni Muslims as well. Islam among the Azerbaijani is a reflection of the historical ties that exist between Azerbaijan and Iran. Until the twentieth century, most Azeri identified themselves as Muslims rather than Azerbaijani or Turks. They believe that being a "spiritual community of Islam" was much more important than being a nation. In Azerbaijan, religious practices are less restrictive of women's activities than in most other Muslim countries. Most women have jobs outside the home, and a few have attained leadership positions. However, some evidence of the traditional, restrictive female role remains. Azerbaijan experienced severe economic problems during the first years of the collapse of Soviet Transcaucasus republics. But today it is the most powerful and developed country in the South Caucasus. The rate of unemployment has significantly decreased during the past several years. * Ask the Lord to raise up strong local churches among the Azerbaijanis.View Azerbaijani in all countries. Location in Country: Along the Caspian coast in the southern Caucasus Mountains.